With Superman hunting for Batman in the swamp and Jon and Damian in tow, Lois is feeling a little like a third wheel. Spotting a fire on the horizon she goes to investigate and discovers the tree marking Goldie's grave on fire. Worried that a place of significance to the Kents has been burnt down Lois heads over to the Branden Farm but when they deny knowledge of it, Lois smells a rat and makes her way into town in hopes of finding her boys. Lois spots Candice, who was severely wounded during the giant octopus attack, seemingly unharmed. A curious Lois follows but is horrified to find a hub network of CCTV camera's all fixated on the Kents. Making a quick escape Lois heads back to the Kent Farm only to find Candice has beaten her home and several key townsfolk are waiting for her with a sinister purpose. Superman meanwhile makes his way to the heart of the house in the swamp and is shocked to discover glass cylinders housing Batman and several of the townsfolk captive! Story - 4: Hamilton County was a nice nod to Smallville but it was always a little on the weird side, it had an Eerie, Indiana vibe to it from the very beginning. As the town and it's citizens begin to show their true colors it seems that Lois, Clark & Jon have been duped from day one. Black Dawn has neatly brought together several strands of their lives as the Smiths and neatly woven them together. I spotted the clowns that tried to rob the fair, S.H.A.D.E. members, Frankenstein and the Bride as well as Bruce and Damian, so the Kents are not the only victims. Of course this is all gearing towards the aftermath of Superman Reborn and their return full time to Metropolis but it's being done in a stylish and intriguing way. Plus having Lois step out and remind us she's more than meets the eye is always welcome. As much as I've liked their time on the Farm the person who seems most out of place is Lois, I long for her to return to her investigative roots. In the meantime I am really enjoying this strange dark X-Files style twist to this small town and am eager to discover its secrets. Art - 4: I'm not so sure about the look of the townsfolk, they have that slight cartoonish 'rubber' look Todd McFarlane was famous for in Spider-man and Spawn. Perhaps their odd look was supposed to add to their sinister appeal, it worked I thought they were more creepy than endearing. It was really nice to see Lois take centre stage and Mahnke's dynamic pages showcasing the intrepid reporter were superb, I loved seeing her in action. I didn't miss Superman for a second that's also down to some good writing. Cover Art - 5: Heat vision poses are divisive in the fan community. 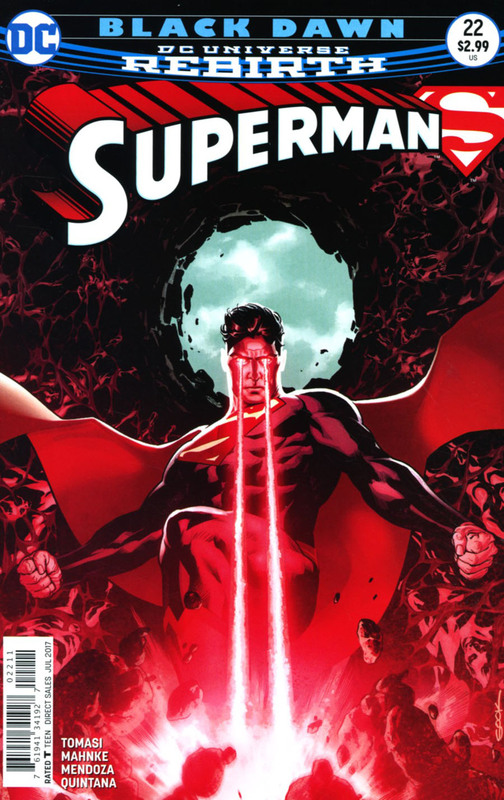 Angry glowing eyes, usually with Superman in shadows, are an artists go to for Superman looking mean. Here we see the full explosive force of his vision powers but rather than looking tired we have a perspective and though it isn't part of the story we have a little narrative. Sook has delivered a superb cover. 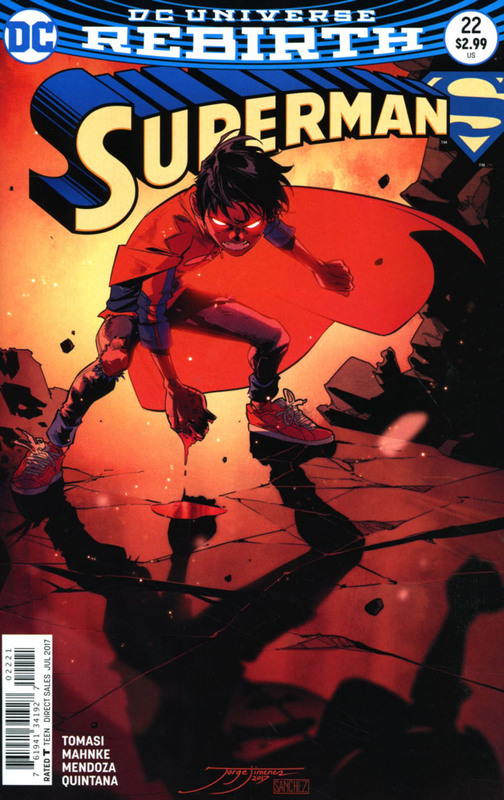 Variant Cover Art - 4: So here we have Jon sporting the angry glowing eyes but we also have a narrative, is Jimenez hinting that Jon's shadow is alive... is this foreshadowing more of what Bessie's milk is capable of? apart from taking out Batman of course!